When the agents of the Raja came to Kowlas Bahadur Khan conducted them to the King, to whom they presented the offerings agreeably to treaty; and in return received rich dresses, besides valuable jewels, and several fine horses for the Raja. Some days after this, the ambassadors represented to Ba­hadur Khan, that if his Majesty, after fixing the territorial limits of the state of Tulingana, would sign a treaty, binding his successors to protect the rajas from further encroachment, their master would pre­sent him with a curiosity worthy of a great king. Bahadur Khan having communicated this offer, the King was impatient to know of what the gift consisted; and the ambassadors being introduced, repeated their promise. Mahomed Shah, finding them sincere, drew up a paper in his own hand, fixing Golconda as the boundary between his kingdom and the Raja’s possessions; conjuring his successors, as long as the rajas of Tulingana refrained from breaking their faith, not to molest them. The treaty being signed with the King’s seal, and witnessed by the judges and the principal nobility, the Hindoo ambassadors pre­sented to the King a throne, set with valuable jewels, originally prepared by the Raja of Tulingana as a present to Mahomed Toghluk, King of Dehly. Mahomed Shah, highly gratified, dismissed the ambassadors with marks of honour and distinction. On his return to Koolburga he held a festival, and ascending the throne in great state, caused it to be called the Tukht-i-Feroza; after which he gave audience, and conferred costly presents and titles on those officers who had merited them by their conduct during the war. The silver throne of his father was ordered, however, to be placed in the treasury, and kept as a valuable relic. I have heard old persons, who saw the Tukht-i-Feroza in the reign of Sooltan Mahmood Shah Bahmuny, describe it as being six cubits long, and two broad: the frame was of ebony covered with plates of pure gold, inlaid with precious stones of great value, in such a way as to be taken off and put on with ease. Every sovereign of the Bahmuny dynasty added some rich jewels, so that in the reign of Mahmood Shah, when it was taken to pieces, in order to remove part of the stones to be set in vases and goblets, the jewellers valued the whole at one crore of hoons. I learned, also, that it was called Feroza from being enamelled of a sky-blue colour, which was in time totally con­cealed by the number of precious ornaments. Going by Firishtah’s liberalities in mixing fact and fiction, this story presents us with many theories regarding the origin and destruction of the throne which was a potent power of Bahamani Sultanate from the day it formally became the Bahamani throne(March 23, 1363). 1. Is this the original Kakatiya throne inherited by the Musunuri Nayaks before it was transferred to Delhi? If yes, why was it not transferred as a part of the original booty, along with the king? 2. Is this commissioned by Malik Maqbul or other governor, to be gifted to the Tughluq Emperor? If this is the case, it is highly probable that Malik Maqbul got it commissioned, going by the fact that he himself, under the name of Nagaya Ganna was the last Hindu Governor of the Fort of Warangal under Hindu Rule. Or did he mask it’s origins due to the respect he held towards it? 3. Did the Musunuri Nayaks commission it to assert their independence? 4. Firishtah writes that it is a surprise gift to the Bahamanis. But, is it? Or is Kapaya Nayaka coerced to hand it over? 5. Did the last Bahamani Sultan make it poor or did he dismantle it? 6. Ismail Adil Shah, in a war against the Baridshahis advanced on Bidar and sat on the throne his father served. This opens up another arena – is the Baridshahi throne Bahamani throne? If yes, what happened to it after the kingdom was annexed by Bijapur? Unless destroyed, going by it’s cultural value, it would have become the Bijapur throne for sure. The capital of Vijaynagar appears to have been established on 18 April 1336, equivalent to Salivahana Saka 1127 Prabhava Chaitra Pournami, Sthiravaram Ratri (night) where all activities of Sankalpa were completed and the foundation stone was laid in Bahula Paksha Amavasya at Midnight.This is confirmed by Raya vachakam which is a contemporary document. It is learnt that saint Vidyaranya Swamy made all the arrangements for the foundation laying ceremony. The saint by himself conducted mahasankalpam, invoked the deity of Vastu, determined the directions of North and South with the help of Dhruva Star and the Trisanku was erected. On East and Western directions Sankhas (conches) were arranged and molten gold of sixteen shades were poured in the foundation pit in large quantities. Sri Samrajya Lakshmi yantram was then placed and opposite to the site a reservoir was dug where his disciples were asked to wait and watch for his signal of most auspicious time for laying the foundation stone. The Saint conveyed to them that he would give an indication by ringing a bell and would blow a conch shell. A brick was tied to the end of a thin string, along with Vastu yantramu, Diamonds and Mercury and arrangement was made such that by slicing the thread, the brick would fall into the foundation pit at the auspicious moment. Making all these arrangements and instructing Harihara and Bukka Raya the Saint went over to the top of the hill and was engrossed in the astronomical calculations and was waiting for the auspicious moment. The Saint planned the time and state of various planets such that the capital and the Empire that was likely to be established would flourish for 3600 glorious years. To the misfortune of Hindus, a Tantrik was worshipping lord Shiva at a place down the hill and after completing his worship rang the bronze bell and blew his conch shell loudly. Harihara Raya who was at the foundation pit awaiting the indication from the Saint immediately sliced the thread and the brick fell into the foundation pit before the auspicious moment arrived. Within a short time another sound of the bell and and blowing of conch shell was heard. Harihara and Bukka Raya ran to the top of the hill to enquire abount the two sounds at different moments. Vidyaranya Swamy lamented that the foundation stone was laid much before the auspicious time. He after examination of the time and planetary position at the instant of dropping of the foundation stone predicted that the empire would lost for 260 years and would be destroyed by the enemies due to inauspicious time of the ceremonial event. He also said that the prediction of sage Vyasa to him at Kashi has come true. It appears Sage Vyasa stated that the empire would last 300 years. The Vijaynagar city was thus established and the empire flourished for nearly three centuries from 1336 to 1646. The glorious empire established with the blessings of Saint Vidyaranya Swamy in 1336 lasted for 310 years. However, it lost its glory after Tallikota Battle in 1565. The glory of the empire lasted for 229 years that is very close to the predictions of the saint. Although the saint took all precautions and planned for an empire to last 3600 years, the destiny did not smile at the foundation ceremony and the foundation stone fell at an inauspicious moment and destiny came out victorious. Pandyan Empire – An Overhyped Kingdom? 1. The name Pandian originates from the word bull. The current etymology provided is, Pandian means one as virile and powerful as a bull. In that case, one would have used a tiger or an elephant as their name, not surely a bull! This means either a bull is much above their social stature(meaning they are social outcastes or tribals vying for recognition in society) or a bull(not tiger or elephant) is the mightiest animal they may have ever come across – an indicator of how small their kingdom is. Add the Southern Tamil custom of Jallikattu to it, you will get an impression that they took the title of a village head who subdued a bull. Note that the other meaning of the word Pandian is old. Surely, no one will have a dynastic name as old man. 2. There is a reference to Malayadhwaja Pandya in Mahabharata – he shoots a few arrows at Aswathama and he is killed by Aswathama without any effort. There is reference to a queen of Pandyan Kingdom – Meenakshi who conquered the whole world and married Lord Siva himself. Both, if looked as independent events fit the greater picture perfectly. However, the real problem is that Meenakshi, deified as Goddess Meenakshi of Madurai is the daughter of Malayadhwaja Pandya. There is no reference of Meenakshi defeating Yudhistira or Parikshit or Balarama or Janamejeya or any such, her supposed to be contemporary heavyweights. This clearly is a later insertion in an attempt to make their kingdom antique, going by the fact that the contemporaries, Pallavas and Cholas have got the main temples in their capital cities on a firmer footing. Another thing to note here is the name Meenakshi – eyes like a fish. 3. Fish is the emblem of the Pandyans. Is the name Meenakshi invented because of that, no one can prove. Being known all over the world for their navigation skills and for their pearls, they may have built up a story on top of that – Kumari Kandam – a large Pandyan ruled landmass south of Tamil Nadu completely submerged now. 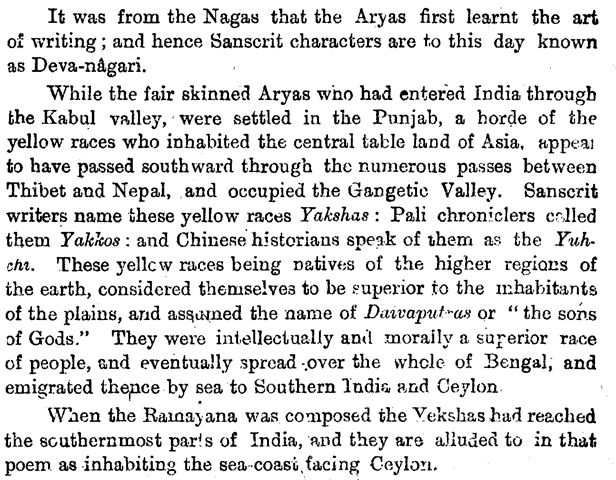 Note that it is ruled only by the Pandyans, not their contemporaries of Cholas and Cheras. May be, it’s nothing more than a small island in the Palk Strait washed away by a tsunami. 4. Till the last, almost all the rulers shared the throne with four or five – clearly an indicator of a power sharing custom of an older date, an indicator of the fact that supremacy of a single family is not tolerated – either they are allied tribes with one dominating the other or they saw too much bloodshed in wars of succession, which ironically, is the reason for their downfall. 5. For a kingdom that antique and that important with considerable literary output, we don’t have a clear picture of the dynastic succession, even in the last hundred or two hundred years unlike the Cholas. On top of this, we see that a dynasty setup by Kadungon around 590 AD calls itself the Pandyan Empire, there is no link between the older Pandyan lines and the new one. Though there was an eclipse of power around 900 due to the Cholas, they bounced back by 1220, only to be one of those five South Indian kingdoms which collapsed before the Delhi Sultanate. All of this point to an usurper using the name Pandyan, a word long forgotten in history and weaving history around it to claim legitimacy. The king list is below. Can anyone think of a more crackpot theory? 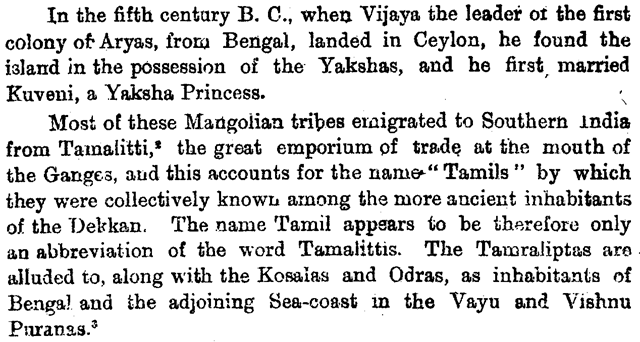 This one came from Kanakasabhai Pillai from his magnum opus The Tamils Eighteen Hundred Years Ago. I won’t give any commentary on this; just read and enjoy.